This 42" disc is suitable for 3/4 length portraits, and medium still-life setups. It folds down to 1/3 of its open size, and comes with a storage sleeve. We suggest the purchase of a pivoting arm and stand, to hold the disc where needed -- especially if you are working without an assistant. Box Dimensions (LxWxH) 15.45 x 15.2 x 2.8"
5-in-1 Collapsible Circular Reflector Disc (42") is rated 4.7 out of 5 by 418. Rated 5 out of 5 by Chris from I LOVE IT Nothing you won't love about it. Each side of the reflector is amazing quality, and reflects, diffuses, puts out great light in general no matter what side you use. It is very easy to use, set up, etc. It is very durable, and fits in the case great. WARNING: You may have trouble closing up the reflector and getting it back into its case at first, you may not think it bends the way it does to fold up inside, but just follow the small booklet it comes with and it with very quickly and easily explain the right way to close it up. Another thing, when you open it, it kind of unfolds itself and poofs out, so don't be alarmed, it's pretty cool. Rated 4 out of 5 by Dan from Good Option for a Reflector I use this in my short films and will be using it in an upcoming feature. It is a solid reflector and I like the colour options there are. It is a good size unless you're shooting in a really small or big space (which should be expected when buying reflectors of a specific size). The zipper does not seem very strong. I haven't had any trouble with it so far, but I am a little concerned about it getting snagged during a shoot. It is also a little difficult to get the sleeve on the reflector, but that is inherent in any reflector design. All in all, a good buy and and a comparatively cheap way to bring in some subtle lighting elements. Rated 5 out of 5 by Iron Mike from Essential Tool For Light Control Use of this 42 Reflector hand held or combined with a reflector holder on a stand is a must for better lighting control in outdoor or studio photography. 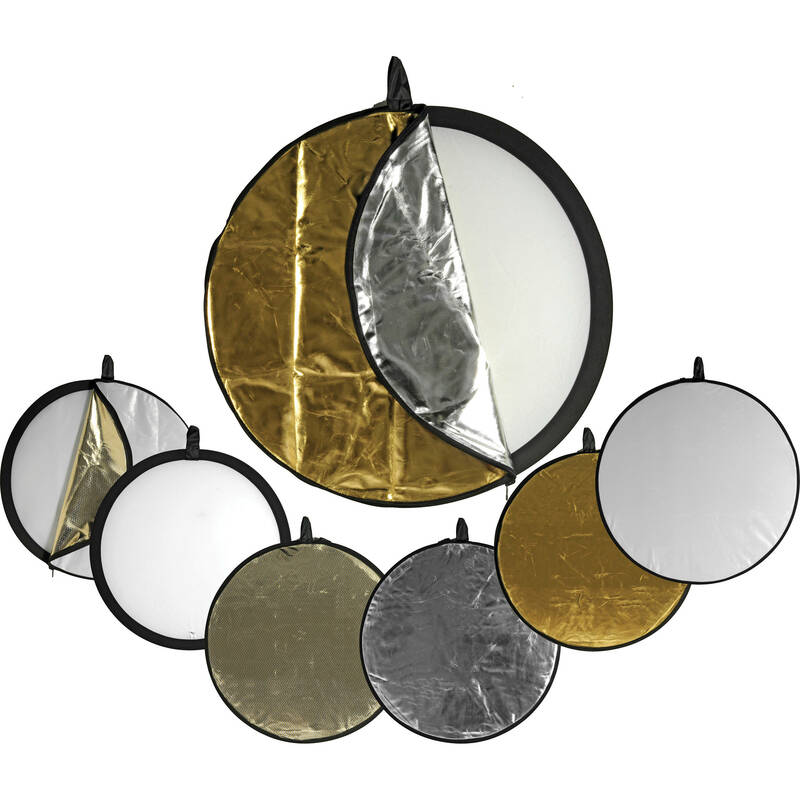 The four reflective surfaces and diffuser frame are versatile enough for any lighting condition you will encounter. Folding to its size and packed in its own carrying case I can take it on location attached to my backpack with my 32 reflector kit in the laptop pocket or fold and store on a shelf using minimal space until needed. I highly recommend the 5 in 1 system and intend to add the 22 because you can never have to much light control. Rated 5 out of 5 by Anonymous from Perfect This device has made picture taking outside so much better. The different options of gold, amber, silver, and white are extremely useful. If you are one of those photographers who takes pictures with the sun as your backlight then the gold reflection is for you. I didn't even have to edit the pictures I took with the sun as a backlight using this thing. It was perfect. As well I had no trouble changing out the different colors by myself. The only con about this product is that you need someone else to help you hold it while you take pictures. But other than that this is a must for anyone who wants perfectly lit pictures. Rated 1 out of 5 by David from Poor quality diffusion material I owned this reflector for many years. It was purchased with an Impact stand and boom arm. The diffusion material used in this panel has a weave that creates a large star pattern in images making it impossible to get a correct white balance across your image. Also the reflective overlays are of very poor quality and the reflective surface peels off over time making them useless. I have tossed mine in the dustbin. Lastolite has a video about these problems on their website. It is worth watching to see the difference between these cheaply made Chinese panels and good ones such as those made by Lastolite and F.J. Westcott. Rated 5 out of 5 by Spyke from So much bang for the buck Used recently on a shoot in Cheery fields in Yakima. It has so many options in such a small compact device - easy to carry on location. I used the disc as a diffusion, cutting sunlight for some shots and with the simple zip on reversible cover four reflector options are easily employed. The gold was especially powerful and ads a nice sunrise look to exteriors. Used with a C-Stand or held by a steady hand this 5 in 1 is perfect for outdoors and makes a nice fill for studio interviews. The only con being I can see the zipper jamming and failing at some point, but it would still be usable. So far so good. Rated 5 out of 5 by Suzi M. from Great for My Needs This works well for me as a casual hobbyist. The only thing I don't like is that the white side is actual the internal piece and the silver is a cover - so flipping back and forth is not an option. You would either need to purchase two of these and use one as silver and the other one as white/clear, or elect to by a separate reflect that has white on one side and clear on the other...but then you can't use the white side as a diffuser. I would probably just go ahead and buy two of these for that purpose so you don't have to constantly be switching in the middle of a shoot. The quality is great, and the light is consistent. I bought mine with the matching stand it is a great value compared to more expensive options. Rated 4 out of 5 by Rae from Works well It does the job. It's fairly large, which is nice for certain things, yet it folds pretty small. It's convenient being able to switch between the colors depending on the look you want. I am a photography teacher and I use it in the classroom when doing the lighting and portrait unit. It allows my students to see why reflectors help, how they are used and how the different colors change the lighting. I haven't used it too much yet, but seems like exactly what I thought it would be. It is a little hard for my students to fold down, but that's workable and I don't think there is anyway around that. How should I care for this product?If I want to get the wrinkles out of the white side to use as a background can I steam it? Only the translucent center can be steamed to remove wrinkles. The covers cannot. When white is facing out on the front side, which color is facing out on the back side? I want to be able to instantly flip back and forth between white and silver without needing to remove the cover, turn it inside out, then reassemble the unit. Kevin, I'm almost positive off-hand that the pure gold is opposite the white. :-/ Silver is opposite the silver-gold mix. Translucent is the middle part. Is it possible to bounce a tungsten light off of the reflector? Or shine a tungsten light through the white diffusion? I have 650 Watt, 600 Watt, and 1000 Watt lights. Thanks. I see no reason why it should not be possible. The only problem could be the heat from the light, if the distance is to short. As I have not used the reflector together with tungsten light, I can not give you any guidelines on the distance needed. What is the difference between this and the westcott? Im choosing between the 2. In reality not much however this disc is made from better and more durable materials. I&rsquo;m having trouble folding this up. Help please? I actually learned folding it on YouTube. You need to fold an &lsquo;8&rsquo; then twist on both sides in different direction. Can I use this to diffuse light through it or only for reflection/bouncing? Yes, you can use this for light diffusion. I use it for diffusion more often than I use it for reflection/bouncing.